My Mother’s Sari | GetLitt! A child's imagination transforms a sari into a train, a river, a swing... and many things magical. The unconventional pictures combine photographs and acrylics in dramatic, original ways. 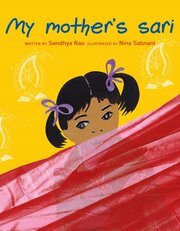 Using lots of illustrations, the story of my mother's sari depicts the real ways a child plays with the mother's sari. But on a broader level, it brings to the surface the bond between a child and the mother. The omnipresence of the mother in every aspect of the child- while at play, while at home, while at rest. Its more than just a simple way of wrapping a sari, its about wrapping the emotions around it. i like the girl's ideas !! This is a sweet and simple story of a little girl who plays around with her mothers sari. Letting her creativity soar, she imagines the sari to be a sort of friend who enjoys being with her. This book is one of the most interesting books I've read.It has a wonderful connection of words properly woven on the string.It depicts the imagination of a small child, his/her creativity of what to do with a sari to make it a play for themselves.